Misused Words Have you ever said something and no sooner than it escapes your lips, you wonder-did I say that right? Did I use the right word? Chances are it was one of the 200 words covered in this book. I’m not saying it covers all the words, but it touches base with most of the more common culprits. Ever wonder if you should use ‘good’ or ‘well’? How about ‘lie’ or ‘lay’–that’s one that almost no one gets right. How about then and than, try to and try and, which and that, which and who. There are many that seem to stump people. Learn these words, and many more when you read this book. It’s designed to help you remember the proper word to use in each circumstance. And not just words, but sayings, odd punctuation, and even a few Latin expressions, such as e.g., ergo, etc., and i.e. (Did I just say ‘ergo’. If I do that again, smack me.) I know you think you are familiar with these, but despite their ubiquitousness (Smack me for that also. ), there might be a few odd rules that pertain to using Latin expressions that you’re not familiar with. It’s worthwhile to learn them (especially if you intend to write). So, get your act together. 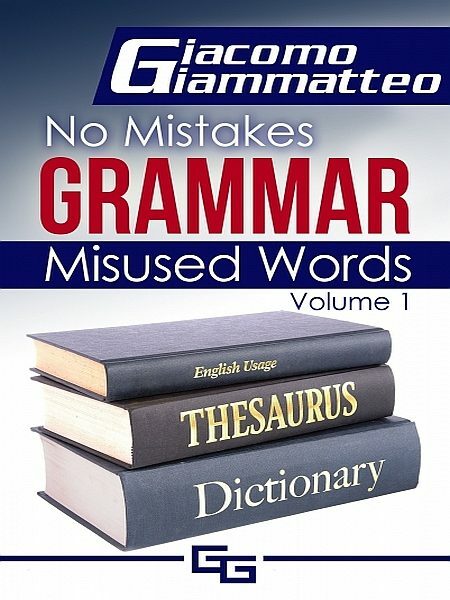 Forget the coffee today and pick up a copy of Misused Words. You’ll be glad you did. Otros ebooks de Giacomo Giammatteo.